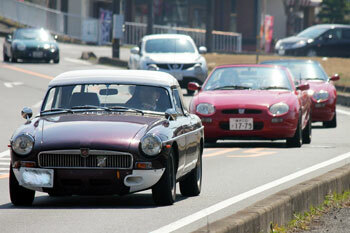 On a beautiful spring day, sixteen members and guests of the MG Car Club Japan Centre enjoyed a short touring in Ibaraki, Japan, which is about 60 miles north-eastwards from Tokyo. 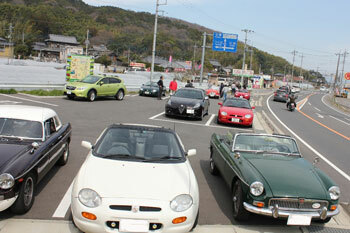 Eight MG cars, TD (1953), B (1964 and 1980), and F (1997 - 1999), got together early in the morning at Yatabe-East Parking Area on Joban Motorway, and started with high-speed cruise to the north. 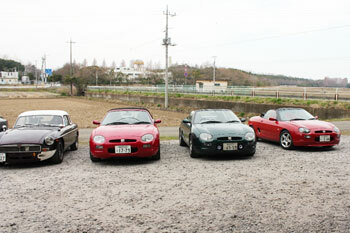 After coming off the motorway, the MGs and the drivers enjoyed driving on country road called "Fruits line" and hilly winding road near Mt Tsukuba. Taking a pit stop at a strawberry farm in Yasato, the party finally crossed the finish line at a restaurant "Mille Fleur" in Tsukuba for lunch. 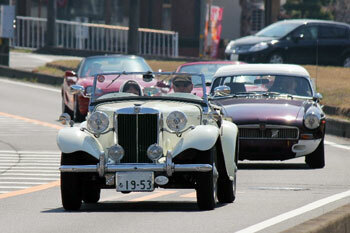 It was a pleasant day, as the weather was so kind and every car finished without any troubles.